Our Taperback gym singlet is a no-nonsense must-have bit of kit. Ideal for weight training, cardio, team sports or just wearing around the house on rest days, it covers all bases. Generously cut so you can pull it on and off without a struggle when under the influence of a pump. It will last for ages no matter how many times a week you want to wear it. In classic black or white. Great material, well made and very comfortable. My son loves it!!! And it was free!!! Will be ordering more with future purchases. 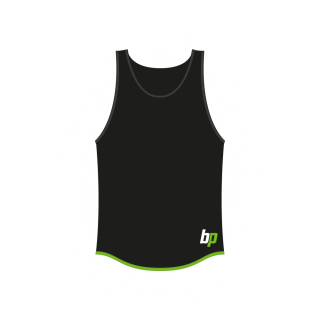 A nice Singlet that emphasises all your hard work inside and outside the gym. You can wear it while you train and you can wear it on a nice and sunny day. Most guys would be reaching for this Taperback on Chest Day, Back Day, when hitting Shoulders and basically most days beside Leg Day.